Buckeye Valley senior Gabrielle Legg (3) fires a shot toward goal during the first half of Monday’s MOAC finale against visiting Galion. When teams list out the goals they want to achieve by the end of the year, most teams in most sports will put “win a conference championship” as one entry. The Barons (10-5, 5-1) are on the banner thanks to a 9-0 victory over visiting Galion in the regular season and MOAC finale Monday evening in Delaware. BV clinches a share of the championship with Ontario, who defeated Marion Pleasant Monday. Clear Fork gets a shot at joining the two Wednesday at Marion Harding. 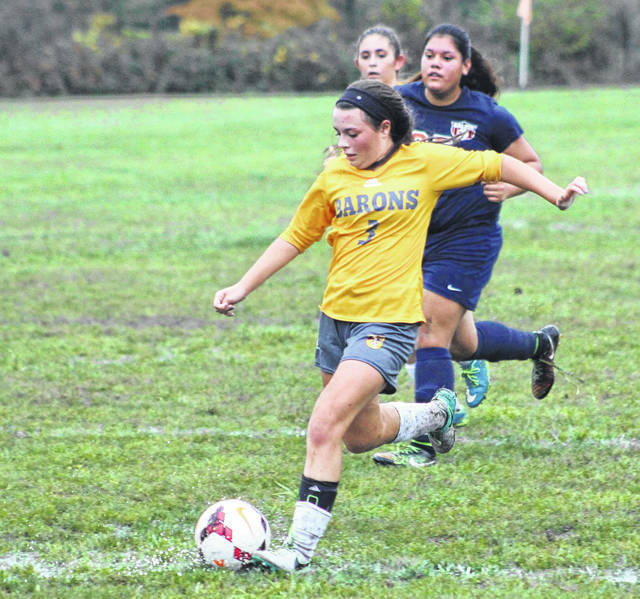 This is the fourth season of girls soccer in the MOAC and the Barons knew they had a shot after the winner of the first three titles, Jonathan Alder, bolted for the Central Buckeye Conference. But Clear Fork and Ontario proved just as formidable. Clear Fork beat BV, who beat Ontario, who beat Clear Fork. The biggest problem BV had to deal with in the clincher was the mud hole at the top of the box. Wirth is one of six seniors who celebrated Senior Night, including Jillian Hon, Gabrielle Legg, Dominique Legg, Tylor Beougher and Maja Milenkovski. Ellen Riley, Daelynn Rosser and Dominique Legg also scored first half goals and Milenkovski, Dominque Legg and Gabrielle Legg helped out with assists. Rosser added her second goal of the game early in the second half. Ali Granger, Beougher and Gabrielle Legg also tallied scores and Megan Hon had an assist to round out the scoring. Cami Crawford had one save in goal for the Barons. Drucilla Singer stopped 13 shots in goal in the first half and Allison DeNero had 12 saves in net in the second for the Tigers (1-12, 0-6). BV is the fifth seed in the upcoming Central District tournament. The Barons host 12th-seed Lakewood Monday. A potential BV versus Big Walnut matchup could happen in the second round Oct. 19 if the Barons win and the Golden Eagles, the second seed, defeat Whitehall-Yearling. BW would host. Buckeye Valley picked up a lopsided win to end the regular season, blanking host Galion 6-0 in MOAC action Monday evening. The Barons scored four first-half goals to set the tone — all in the first 15 minutes of the game. Bill Daily scored in the eighth minute, Jared Gedde made it 2-0 in the 13th minute, Ben Daily added a goal less than a minute later and Bill Daily found the back of the net in the 15th minute. Gedde and Aspen Schneller scored in the second half to smooth out the scoring summary. Cole Davis and Jack Scheeler split time in the BV goal, combining for three saves. Worthington Kilbourne 4, Olentangy 1. Delaware Christian picked up a convincing three-set win Monday, topping host Grandview 25-8, 25-8, 25-17. The Eagles got it done from the service stripe, finishing with 22 aces in the win. Sarah Rosato had 12 aces all on her own. She also had five kills and five digs. Other DCS standouts included Lyssi Snouffer, who finished with 15 kills — including her 300th of the season — to go with 14 digs, five aces and two blocks; Erin Baushlaugh, who collected 20 assists, 11 digs and two blocks; and Anna Fuller, who had a 13 digs and two aces. Also: Olentangy Orange def. DeSales 13-25, 8-25, 25-12, 25-18, 15-12. Gazette sports editor Ben Stroup contributed to this report.